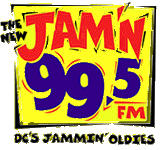 After the merger of AMFM Inc. and Clear Channel Communications, the Jammin Oldies format, which AMFM had been debuting in many markets began to falter. With little corporate support and a high burnout factor in the music, it was not surprising that the format didn’t last longterm. In the meantime, Clear Channel began debuting its “brand” of CHR’s in many markets. Washington, already home to Bonneville’s weaker powererd Z104, was next in line. With the “Kiss” name unavailable, Hot 99.5 was to be born. Getting there was where things got interesting.